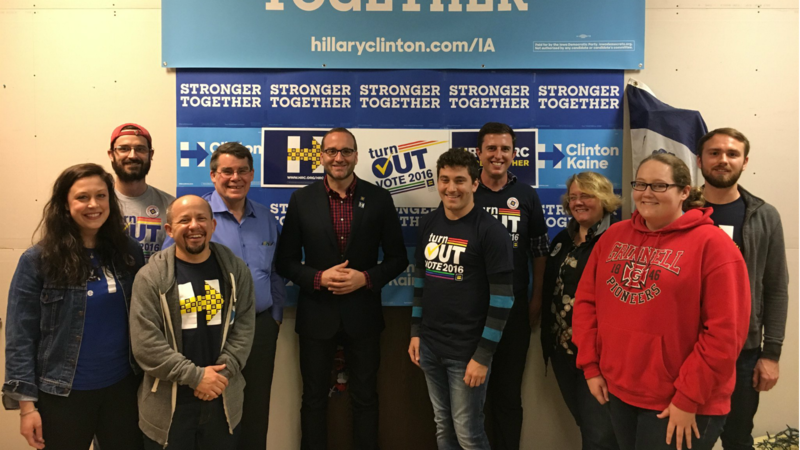 As part of HRC’s unprecedented mobilization of LGBTQ voters across the country, HRC President Chad Griffin visited an HRC member phone bank in the pivotal swing state of Iowa this week. Griffin stressed how important the LGBTQ vote will be to electing pro-equality candidates up and down the ballot this November. More than 45,000 LGBTQ voters here in the Hawkeye State. These incredible volunteers are working to #turnOUT every one. Joining Griffin was Iowa Senate Majority Leader Mike Gronstal, a longtime ally of the LGBTQ community. Just the day before, HRC organizers greeted Anne Holton, wife of Senator Tim Kaine, in Council Bluffs. Holton was there to thank and rally the volunteers as we work through the final 30 days of this campaign. Earlier this month, HRC announced its endorsement of Patty Judge for the U.S. Senate seat currently held by Chuck Grassley. HRC has also endorsed Monica Vernon for Congress in IA-1, which is currently held by Rod Blum, and Jim Mowrer for Congress in IA-3, which is held by Congressman David Young. HRC has also endorsed Rep. Dave Loebsack for re-election in IA-2.